FASHION STYLE AND WE !! : 7 most SURPRISING fashion trends you probably didn't know about!! 7 most SURPRISING fashion trends you probably didn't know about!! I know that I’m not the most fashionable person to ever walk the face of the Earth, but lately I’m seeing a lot of surprising fashion trends. Some things I would have never thought would be cool are either coming back or coming into the lime light for the first time. These are the 7 most surprising fashion trends you probably didn’t know about either! That’s right, designers everywhere are starting to put out see through plastic purses and people are buying them up! A few of them are actually kind of cute but my biggest question about these purses is: where do you hide your tampons from prying eyes when everyone can see into your purse? 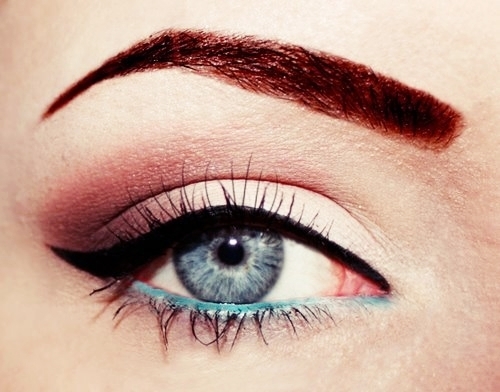 I personally think teal eyeliner is pretty cool. It makes your eyes pop and it draws a lot of attention! I’ve actually started to use teal and bronze together and it looks really cool! I think that this is a perfect way to change up your makeup for the summertime without having to do too much. And, it’s a perfect daytime beachy color when you want to look casual all day under your sunhat. That’s right, 3D printers aren’t just for making guns anymore. Now you can use them to print up your own necklaces, rings, and even one of those see through plastic purses. But, if you have enough money to buy a 3D printer (a pretty high ticket item) I think you can probably afford to buy your own accessories, pre-made and everything. But, this does take making your own jewelry to a whole new level. Yes, jean vests. Kind of like denim jackets with the sleeves removed. People are wearing them with floral skirts and oversized tees, maxi dresses, mini dresses, everything under the sun. I think they can be very cute when worn right but I still feel a little bit like a Levi cowboy when I wear them with jean shorts. If you try this one out be very careful not to overdo the denim! The boyfriend look is back in! That’s very exciting to me since I love the look of rolled boyfriend cut jeans with over sized tees! It’s so cute without looking sloppy. But now, we’re adding vests and trousers to our menswear for women repertoire. Well ladies these were the fashion trends that surprised me. What trends do you find surprising? Let me know down below!